Street sign to the Fairfax County Parkway. Image by the author. This article was GGWash’s second most popular post in 2018. If you like what you read, please support our journalism by joining the GGWash Neighborhood, our membership program. You contribution keeps our blog going, and also connect you to our community of readers. Join today! Location of the Fairfax County Parkway. Northern Virginia is not new to these types of lanes. It implemented HOT lanes last December, and cost of tolls on I-66 inside the Beltway has dominated headlines since. Toll lanes also exist along I-95, I-495, and portions of I-395. However, the Fairfax County Parkway is much different than these other roads, and bringing in HOV and HOT lanes would be challenging. Inside the Beltway on I-66, HOT lanes are implemented during the morning and afternoon rush hours. During that time, commuters either must have two people in their vehicle or pay a toll based on dynamic pricing that updates every six minutes. Solo commuters can avoid tolls by taking other roads, such as US Route 50. However, this system wouldn’t work along the parkway because many neighborhoods' only outlets are via the parkway. That means residents would be tolled any time they left or entered their neighborhoods during those times. On I-495, additional lanes were added and used as HOT lanes, but this too has its own set of challenges. Fairfax County Parkway has 83 intersections along the 31-mile stretch which VDOT is studying. Left turns from the regular lanes of the parkway would block the HOV or HOT lanes from traveling through unencumbered. This could be remedied by reconfiguring intersections to remove left turns or adding overpasses, but overpasses are an expensive solution (based on the cost of construction and the additional land needed to accommodate them). Fairfax County Parkway heading West at Hooes Road. During a presentation at Sangster Elementary School on October 10, Thomas Burke of the FCDOT said at this time there is not much demand for HOV-3 (a driver plus two passengers) on the parkway. However, HOT lanes could leverage the currently-unused capacity of lanes with drivers willing to pay a toll. As Fairfax County continues to grow, it needs a plan other than just adding lanes. Any solutions that include adding HOT or HOV lanes could support express buses running along the corridor. Without these special lanes, buses will be subject to the same traffic as solo drivers. Route 496 has been proposed with limited stops between the Franconia Springfield Metro Station and the future Herndon Silver Line Station, which is currently a park and ride. This route would greatly benefit from express lanes. 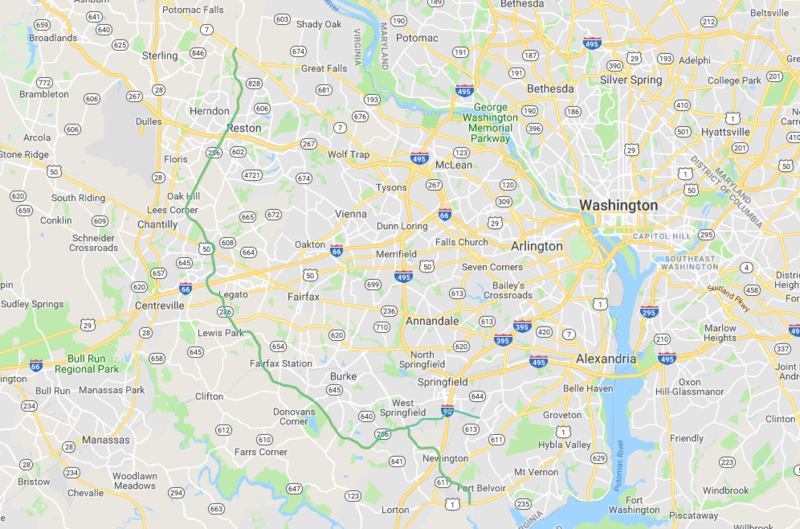 Fairfax County is now seeking your opinion on the future of the parkway. A survey went live on Wednesday, October 17, 2018, and will be open for 30 days. Following the survey, preliminary alternatives will be developed and vetted by the public in the Spring of 2019. The comprehensive plan amendment process is slated to be complete by the beginning of 2020.